We begin with this cross-cutting factor because it is foundational to everything else. Data clearly emphasizes Charlotte-Mecklenburg’s profound segregation by both race and income, and how significant a barrier it is to opportunity. It is also a barrier we—as a community and part of larger American society—have little practice in confronting openly. We will have to ask ourselves, deliberately and regularly, if we are dismantling the effects of segregation and racialization, and if the foundation we are laying for the future is free of them as well. We may have inherited obstacles to opportunities put in place over generations, but we have the power and responsibility to ensure this same inheritance is not left for our children and youth. Spatial mismatch between jobs in high-opportunity vs. low-opportunity geographic areas. This includes the critical absence of public transportation necessary for people to access jobs and services. Lack of affordable housing for workers in opportunity-rich areas of the community. Concentrations of low-income students of color in low-opportunity communities and concentrations of higher wealth white students in high-opportunity neighborhoods. Disproportionate number of residents in opportunity-poor neighborhoods who lack devices, digital literacy skills, and access to broadband Internet. 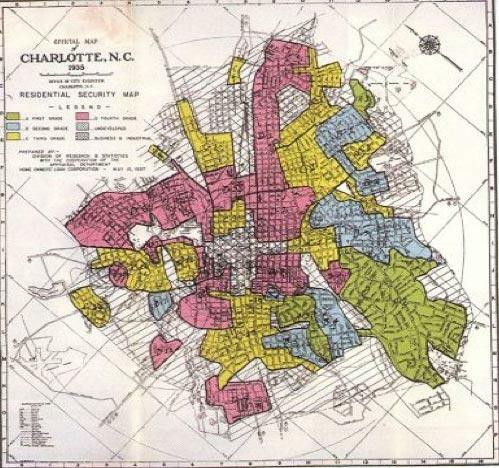 Charlotte followed a similar pattern of segregation that many Southern cities experienced following the Reconstruction Era. 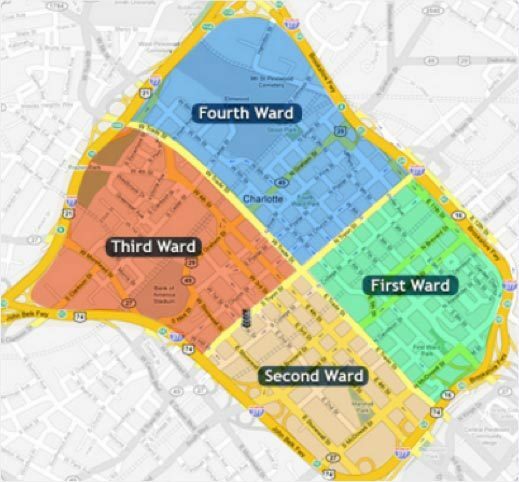 As early as 1910, discrete black and white areas were created across the four wards that formed the city. Ultimately, it was the federal government’s New Deal programs that gave impetus and financial resources to support racial discrimination of Charlotte-Mecklenburg’s African-American community. Starting in the 1930s, segregation by race was sanctioned in the New Deal’s backing of low-cost mortgages and refinance loans to promote and preserve white homeownership. For white families, who thrived from decades of accrued wealth benefits, these programs spurred one of the largest accumulations of wealth in our country’s history. But the same cannot be said for families of color. Federal “red lining” prohibited them from getting loans to buy a home. All neighborhoods where the majority of residents were people of color received the bottom rating for investment. Even middle-class African-American neighborhoods were ranked at the bottom. This set the stage for policies and outlooks that not only deepened economic divides in the Charlotte-Mecklenburg area, but engendered deep divisions based upon race as well. In the 1950s and 1960s, federal funding came to Charlotte-Mecklenburg for the purpose of demolishing neighborhoods in the name of “urban renewal.” The Second Ward’s Brooklyn neighborhood, consisting of 1,400 homes and over 215 Black-owned businesses, was razed and no replacement housing provided. The entire community was disrupted. 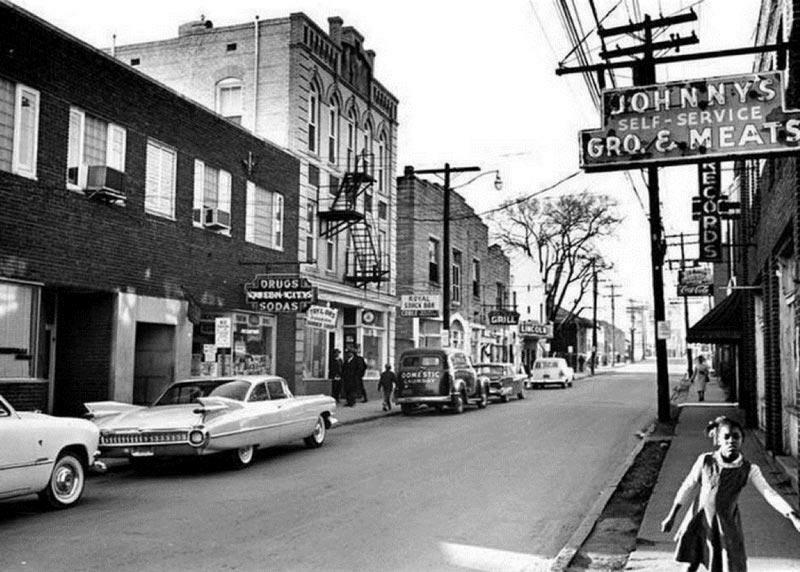 Subsequently, urban renewal targeted Greenville, northwest of Uptown Charlotte, and a large portion of First Ward, both African-American neighborhoods as well. Similarly, deep racial and economic separations have persisted in our education system. Now, with a county population of a little over a million people, approximately 147,000 students are enrolled at CMS, with about 39 percent black, 29 percent white, 23 percent Hispanic and 6 percent Asian.ix A third of the 168 schools in the system are segregated by poverty, half are segregated by race and a fifth are hyper-segregated, meaning that 90 percent of their students are from a particular race.x Over half of all African American students attend schools that are 90 percent non-white. The majority of white students attend majority-white schools in our high-growth southern and northern suburbs where most of our new schools have been built in recent years, as well as in more affluent close-in neighborhoods such as Myers Park and Eastover. In CMS, schools with the greatest percentage of white students, 82% of third graders read at or above grade level. Proficiency drops to 59% at the balanced campuses, and to just under 29% at the ones with the highest concentration of black students. The cumulative effects of systemic racial and economic discrimination, as well as the re-segregation of public schools, have largely maintained and, in some cases, exacerbated a sharply segregated housing market. This market has resulted in a separate and unequal neighborhood geography. The pattern is unambiguous—a wedge of predominantly white, wealthy neighborhoods to the south and southeast of Charlotte that is similarly represented in our northern towns. In contrast, the crescent of lower-opportunity neighborhoods of color discussed earlier wraps around our center city. As demand for housing closer into the urban core grows and gentrification continues to drive up housing prices, many lower-income people of color in the crescent are being pushed out to older suburban neighborhoods where they can find affordable housing. The deep disparities we describe represent sharp differences between opportunity-rich and opportunity-poor neighborhoods. Our measure of opportunity is understood as neighborhood assets and conditions shaping a person’s potential for economic and social mobility. For example, we have a digital divide in which many children and youth living in low-opportunity areas do not have access to computers or the Internet in their homes. This places them at a disadvantage for doing homework and virtual learning. These geographic inequities are, to a great extent, the direct outcome of structures that have existed for generations. Damaging policy failures, such as those in housing, education, transit and lending practices, as well as in the fields of criminal justice and immigration, have stimulated deep social segregation by both race and class and the resulting barriers they have created. Our community is stellar at supporting charitable causes, but at the end of the day, people tend to retreat to their respective corners of work and home. This continues to perpetuate the segregated nature of our city and strips away the possibility of extending social capital to underserved communities as a means of improving upward mobility. The Task Force believes breaking down barriers to equality and forging new bonds that will enhance and strengthen our community are within our collective capacity. Our world is more interconnected than ever; we must recognize our own successes are uniquely tied to the success of others in our community. By building communities where people of all socioeconomic backgrounds have access to quality housing, high-level education, jobs and transportation, we ensure all of us thrive together. Some of us make decisions out of worry that the success of others comes at our expense. This perceived zero-sum game has been most evident in recent debates surrounding CMS student reassignment. While many fear school integration will threaten achievement for students in affluent neighborhoods, research demonstrates that all students, regardless of their background, receive profound benefits from an education in an integrated environment. Similarly, diversity in our neighborhoods and communities ensures all of our citizens receive the benefits and resources that are currently only afforded to a few. By lifting all those in Charlotte-Mecklenburg to a higher level, we may find that we inadvertently elevate ourselves as well. Acknowledge the significant role segregation and racialization have played in our current opportunity narrative and commit to becoming a more inclusive, fair and just community. Provide more opportunities to include all voices, especially those who have been marginalized or excluded, in genuine community engagement and change efforts. While we recognize that “inclusionary zoning” may be the goal that many seek (and may ultimately provide the long-term solution in Mecklenburg County and across the state), we must take action today to ensure we dramatically increase the creation of mixed-income housing throughout Mecklenburg County. Build and support community efforts to increase transportation options and establish more efficient routes for people who live and work in different parts of the city and county. Ensure children, youth and families in all areas of the community have the devices and digital literacy training to connect with broadband Internet. Urge governmental, educational, philanthropic, nonprofit, and faith-based organizations to make funding, programmatic design, and policy decisions through the lens of equity and opportunity. Engage more of our governmental, educational, philanthropic, nonprofit and faith-based organizations, as well as residents at large, in initiatives and opportunities that, A) elevate awareness and understanding of the impacts of segregation, racialization, and inequality and, B) provide tools to help change behaviors and action. What is an Equity Lens? A quality improvement tool used to improve planning decision-making and resource allocation leading to more racially and socially equitable policies and programs. The lens provides a set of principles, reflective questions and processes that focuses at the individual, institutional and systemic levels. It helps decision makers pay disciplined attention to race and ethnicity while analyzing problems and seeking solutions. Equity lens can be adapted for use by all sectors. Provide incentives and use other tools to support development of more mixed-income housing (See additional recommendations in Chapter V). Support efforts by Digital Charlotte aimed at helping everyone in the community take full advantage of digital tools, access and technology. Use a participatory budgeting process in our local government to engage people in decision-making around budget decisions that affect their lives. Investigate multi-sector use of an equity lens tool as a filter for decision-making. Build the capacity of local entities offering opportunities for genuine racial dialogue and powerful training on trust building and implicit bias—e.g. Dismantling Racism—in order to expand their reach into and impact in the community. Identify strategies to encourage greater integration of early care and education programs to start building interracial relationships and trust from an early age. 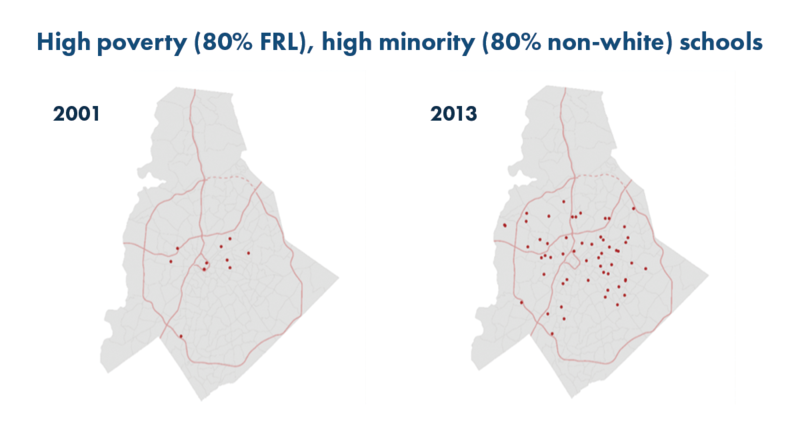 Like many school systems across the country, Charlotte-Mecklenburg Schools is currently in a state of de-facto segregation concentrating low-income/high-need students, the majority of whom are of color, into various low-opportunity pockets around the county. As Robert Putnam noted in his book Our Kids, the interplay between schools, segregation, and student achievement is complex. There is no doubt schools are the sites where disparities show up, but they can hardly be held solely responsible for the disparities themselves. As others in our community have noted, the City of Charlotte, Mecklenburg County, and CMS all have areas of responsibility that dramatically impact where parents send their children to school. Just as we have noted the connectedness of the determinants and cross-cutting factors, we also see that decisions regarding zoning, housing, transportation, criminal justice, and parks work together to define school enrollment. As a result, we believe it is unfair and short-sighted to ask CMS alone to fix issues related to segregation through an assignment plan. To more effectively address the issue, we believe an intergovernmental group should be convened (CMS, Mecklenburg County, and the City of Charlotte) to examine how funding, policies and systems could be aligned to provide a coordinated impact. Galvanize community support for the Board of Education’s School Assignment Vision and Goals. Increase community awareness of the impact of schools with highly concentrated poverty on economic opportunity. Monitor progress of the assignment plan process and continuously encourage the Board of Education to be bold and courageous in developing the new assignment plan. Create an intergovernmental working group to develop a coordinated plan to reduce schools of highly concentrated poverty. Develop strategies to increase private sector funding of the CMS Foundation. Position the reduction of concentrated schools of poverty as a significant enhancer of economic opportunity for all students in Charlotte-Mecklenburg. Raise awareness about community events focused on the link between schools of concentrated poverty and economic opportunity. Support and expand efforts by academic institutions and key intermediaries to provide fact-based presentations regarding the historical context for CMS school enrollment patterns, national best practices regarding assignment plans, relevant data, and objective analysis. Evaluate opportunities to form partnerships and collaborations to inform the community and elected officials about the impact of highly concentrated schools of poverty. Encourage faith, business, and grassroots leaders, parents, and other interested parties from across Charlotte-Mecklenburg to advocate to elected leaders for the reduction of schools with high concentrations of poverty. Request that leadership from all elected bodies authorize the creation of intergovernmental working group to evaluate the strategies and tactics that impact school assignment and enrollment.